I am currently translating and commenting on Prīti Sandarbha, and wanted to share the 61st anuccheda, in which Śrī Jīva Gosvāmī discusses the definition of prīti, given by Prahlāda in Viṣṇu Purāṇa. The use of the relative pronouns yā (which) and sā (that), means that prīti for Bhagavān has some key characteristics that are the same as the prīti ignorant people have for sense objects, but it does not indicate that both types of prīti are absolutely the same. Later on, the distinctions between the two types of prīti will be clearly defined. One type of prīti is a manifestation of māyā and the other manifests from the svarūpa śakti of Bhagavān. The word prīti means happiness (sukham), joy (mut), delight (pramoda), thrill (harṣa), bliss (ānanda), and so on. The word prīti also implies priyatā – which means devotion (bhāva), love (hārda), affection (sauhṛda), and so on. Thus there is a relationship between happiness (prīti) and love (priyatā). Happiness is an experience that makes one delighted, thrilled, joyful, and so on. Love (priyatā) involves pleasing the beloved, desiring to do so, and experiencing the beloved. This also produces an experience that makes one delighted and so on. Therefore, love is superior to happiness, for love includes happiness automatically. Happiness is an experience of elation. The object causing the happiness (viṣaya) does not experience it, only the subject perceiving the object (āśraya) experiences it. The same is true for the opposite of happiness, misery. Love, however, is experienced not only by the lover (āśraya), but also by the beloved (viṣaya). The same is true for the opposite of love, hatred. Happiness and misery are experienced only by their subjects (āśraya), the fortunate and unfortunate living entities. Love and hate are experienced by their subjects (āśraya), lovers and haters, as well as by their objects: the beloved and the hated. The activities of happiness (prīti) have the object (viṣaya) as their substratum (adhikaraṇa), like the meaning of the verb “to light”. The activities of hatred (dveṣa) have the object (viṣaya) as their target of action (karma) like the verb “to kill”. Prīti – the happiness of love – is doubtlessly an intransitive concept. Such is the nature of conscious experience, expressed in intransitive phrases like “to be alive.” Like consciousness, prīti is ever existent. It is not the effect of any cause. Thus it is not dependent on any injunction, like the knowledge of sacrifice, which generates results in the future. Thus, the word prīti has two meanings: love (priyatā) and happiness (sukha). However, Prahlāda’s definition of it (in Viṣṇu Purāṇa 1.20.19, cited above) stresses the sense of love, not happiness, for as “happiness” prīti is experienced only in the experiencer, but as “love” prīti is experienced by both the lover and beloved. Prahlāda’s definition would be very hard to explain if we take prīti only in the sense of happiness. The later type of prīti is a manifestation of Bhagavān’s svarūpa śakti, as will be explained soon [in Anuccheda 65]. Therefore, it was rightly said that, “The use of the relative pronouns yā (which) and sā (that), means that the prīti for Bhagavān has the same characteristics as the prīti of ignorant persons for sense objects; not that both prītis are the same” (yā yal lakṣaṇā, sā tal lakṣaṇā). “You indeed have bhakti for Me, and let it be so again.” (VP 1.20.20). If these two were different, Bhāgavan would have also blessed Prahlāda with prīti for Him. One may propose to interpret the second line of VP 1.20.20 to mean that Prahlāda prays for lack of prīti for sense objects: “O husband of Lakṣmī (māpa), let that prīti for sense objects (viṣaya) disappear, or run away, (sarpatu) from my heart.” Such an explanation, which means praying for renunciation from sense objects, is also not befitting, because Bhagavān did not mention it in His blessings. Moreover, it is contrary to the popular reading nāpasarpatu instead of māpa sarpatu, which has been used in the above interpretation. Although bhakti is a synonym for prīti, not all the words made from the root bhaj [which is the basis for the word bhakti] by applying different suffixes, convey the meaning of the verb prī (to love), which is the basis for the word prīti. When bhakti and prīti take the forms of bhajati [lit. “serves”] and prīṇāti [lit. “loves”], respectively, they are not entirely synonymous. Only the words bhakti and bhakta convey the meaning of the word prī (to love). Therefore, bhakti being synonymous with prīti, is also intransitive (requiring no object). Earlier it was said: “Śraddhā, rati, and bhakti will manifest in that order” (SB 3.25.25). In this statement, although rati and bhakti have only a difference of gradation, and thus are both a type of prīti, yet in bhakti that is called prema and characterized with excessive prīti, love (prīti) becomes more explicit. With this intention he defines prīti by using the word bhakti. The meaning of the Kapila’s statement (SB 3.25.32) is as follows: Guṇa-liṅgānām means those who have the adjuncts (upādhis) of the tree guṇas. They are also called “ānuśravikam, which means that their character is understood from the śruti and Purāṇas. Among these three devas (devānām), namely Śrī Viṣṇu, Brahmā and Śiva one who is called sattva here is Śrī Viṣṇu. The word sattva signifies one who empowers sattva by his mere proximity or it means one who is the personification of śuddha sattva, a specific manifestation of svarūpa śakti. The word sattva here as an indicator of Viṣṇu refers to any one of the unlimited forms of Bhagavān. Therefore, if mokṣa, which is the goal of jñāna, is ridiculed, then it is improper to explain that the meaning of siddhi is jñāna in the verses under discussion. By stating that bhakti is superior to mokṣa, it is also shown that the vṛtti called bhakti is beyond the guṇas of nature. It is more dense bliss than mokṣa. Like the grace of Bhagavān, it manifests in the mind. Moreover, it is called vṛtti of the mind because it is superimposed on the mind. I would like to understand prIthi in more details. I happened to read a portion of siddhantadarpana.I also went through sandarbha 65 in prIti sandarbha. Very excited to see the content between priti sandarbha and siddhanta darpana on this topic pretty consistent including the line of arguments and reasoning. Srila Baladeva has totally imbibed Jiva’s commentary into his’s. While defining bhakti’s svarupa in siddhanta darpana, 4 definitions were proposed and only one is accepted. Bhakti is defined as bhagavad vaSikAra hetu bhUta . The nature of such bhakti is hlAdinI-sAra samaveta saMvit-sAra rUpa. Now , in explaining the sAratvam in hladhini-sAra , sri baladeva writes tat sAratvam ca tan-nitya-parikarAsrayaka-tadAnukUlyAbhilASa viZeSaha. sAra here is abhilASa viseSa.Nithya siddhas have this abhilasa eternally. There is tAdatmya between nityasiddhA’s dharmabhuta jNana and jiva(desiring for bhakti). Hence the conditioned jiva gets the bhakti from nitya parikaras. My question – As per point 3 above, bhakti is not inherent in the conditioned jiva. If bhagavad vaSikAra hetu is the jiva’s desire to favorably serve the nitya-parikarAs , are’nt the nitya-parikarAs also jiva’s? If they are not jiva’s, what category they would fall into ? (neither Achit , not iSwara). If they are “special” jiva(nithya siddhAs), still they are jivas and the point 3 mentioned above would apply to them(jivas being apUrna etc)since they are essentially jiva-tattvas. I am unable to reconcile this point. Requesting you to please kindly help me understand. I will try to answer your question,with permission from Babaji. Nitya parikaras and Sri Bhagavan share the relationship of Dharma and Dharmi respectively. The former are part of the svarupabhuta shakti of Bhagavan,with an ego of dasya(and other rasas) towards Him. Though, in case of Bhagavan no bheda exists between the dharma-dharmi, as there is only a ‘bheda-pratinidhitva’ due to ‘Visesa’. The jivatmas are not dharmas/attributes of Bhagavan,but different from Him due to svarupa-bheda. The mukta-jivas who attain bhagavad-dhama obtain a desired parshada-deha and senses, which are all part of Bhagavan’s svarupa-shakti and hence in a way Bhagavan Himself. So, in the mukta jiva’s case, his body and senses are the jiva’s ‘Asvarupabhuta dharmas’. Similar is the case of bhakti/priti in cases of the nitya parshadas with respect to jivas. The nitya-parikaras are not jivas. Why would they be jivas? They are neither acit nor Isvara. There are three categories: acit, jiva and Isvara. But within the Isvara category there are two further divisions: the category of Isvara-tattva, such as Narayana, Kurma, Vamana, Matsya, etc., and the Parikara-tattva, such as Nanda, Sunanda, Jaya, Vijaya, etc. These parikaras are powerful like Isvara, yet they are not Isvara. They cannot be influenced by Maya. They do not have Isvara-bhava, although powerful like Him. They have dasya-bhava. Thank you for giving the explanation. Parikara’s as separate tattva is unknown to me. Is there a pramana for this as such like 26 tattvas? I have come across 3 types of jivas. However You have mentioned the parikaras are not jivas(incl. nithya siddha jivas? ).You have also mentioned they are neither achit nor ishwara. But you have mentioned they belong to ishwara category. Ishwara vastu is one , jivas are infinite. Even though there are infinite jivas, they belong to one category due to anutva and such essential attributes. Even though there are many forms, functions and names to ishwara , there is only one ishwara because of essential attributes like vibhu , jagad karanatva etc. If parikaras are cetana(conscious) entity they they ought to be a jiva or ishwara. is their svarupa anu or vibhu? All liberated jivas share same qualities of God (satyakama, satyasankalpa etc of the total 9 qualities) . However they differ from ishwara in the aspect of jagatkaranatva etc. ‘Nitya siddha jivas’ are chetanas who are anu ,bhinnaamsha of Bhagavan and part of his Tatastha sakti but they have had anadi bhagavad-jnana and are anadi-bhagavad-sammukha, in contrast to baddha-jivas. This is mentioned in Paramatma Sandarbha by Sri Jiva Goswami.Bhagavan himself by his svarupa-shakti becomes manifest as their body and senses, which is similar in case of nava-mukta jivas(sadhana-siddhas). Nitya-parshadas,on the other hand are not jivas but svarupa shakti of Bhagavan himself. Like Bhagavan, there is no deha-dehi bheda or svagata bheda in them, which is otherwise even in nitya-siddha jivas. Nitya parshadas are similar to Bhagavati Lakshmi or Srimati Radhika who are not jiva-koti but do not manifest the ego of Beings like Matsya, Kurma, etc. but participate in bhagavad-kainkaryam. The nitya-siddha jivas are lower in taratmya to them and serve them ,similar to other mukta jivas. Since they serve Bhagavan in the lilas manifest by antaranga svarupabhuta shakti, not in lilas manifest in prakriti like srishti and pralaya,so there is no question of them participating in jagad-vyapara. They ate vibhu being svamshas of Bhagavan. The purvapaksha relating to “atizaya” is dealt with in the Siddhanta ratna in the same section of the ones that had been quoted earlier. The purvapaksha raised in Siddhanta ratna is that if bhakti/bhagavad-vashikara hetu tattva is bhagavad svarupabhuta shakti manifested in his own svarupabhuta parshadas, how can it be called “different” from his own svarupabhuta jnana and ananda. Sri Baladeva answers this purvapaksha immediately. Please do go through. I appreciate your responses. However to begin with , I would like to know the pramana for cetanas who are vibhu in svarupa and the rest. At this moment, I feel much overloaded to hear about multitude of cetanas with vibhu svarupa and no role in jagatkarana.Vibhutvam and jagatkaranatvam can not be separated, in my opinion. Anyways, also you can drop me an email – scooty.ram@gmail.com if this is getting lengthier. Just to make a point, not only nitya parikaras but everything in paramapada/Vaikuntha is chaitanya and manifestations (svamshas) of Bhagavan himself. There is nothing that is jaDa in Vaikuntha,but is of the same nature as Bhagavan. The palaces,rivers ,clouds,stones and everything are all manifestations of Bhagavan himself (also explained in Govinda bhashya). Vaikuntha is said to be of the same nature and identical to Bhagavan.Even MahaLakshmi is said to be the same (albeit with an ego of dasya-bhava towards Bhagavan due to ‘Vishesha’). Bhagavan as Vaikunthanath does not engage in srishti and pralaya but does it by a non-different amsha known as ParamAtma,who is samashti jivaAntaryAmin and samashti mAyA-antaryAmin and mayaadhipati. Neither Vaikunthanath directly nor his parikaras like Mahalakshmi , nor his Vaikunthaloka take part in srishti and pralaya. So its not necessary that each and every manifestation of Bhagavan being vibhu, also needs to be jagatkarana. Its done only by a particular manifestation of Bhagavan. 1. Between māyā-śakti’s prīti and svarūpa-śakti’s prīti there is a crucial and complex turning point or, even better, a crucial and complex turning process. Could you please explain a little that process? 2. If a man loves his wife (māyā’s prīti) like a sweet queen before becoming a bhakta, later, when he reaches the stages of anartha-nivṛtti, niṣṭhā or ruci (svarūpa’s prīti), does his woman inexorably turn into an evil witch? 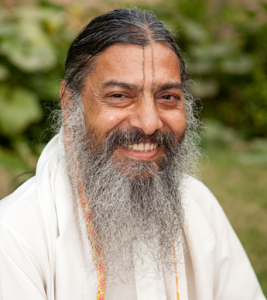 What happens to his initial passionate love on the path of bhakti? 1. You say there is a crucial and complex turning point. Who says this? It is your own assumption, and now you want us to explain it. There is no relation between the two. So where is the turning point? 2. Why should she turn into a witch? From where did you get this idea? The more you advance on the path of bhakti, the more you see God’s presence all around you. So why should your wife, who served you and whom you loved before, turn into an evil witch? Instead of loving her just like a sweet queen, now he should love her like the sweetest empress. His initial passionate love become replaced by devotional love. 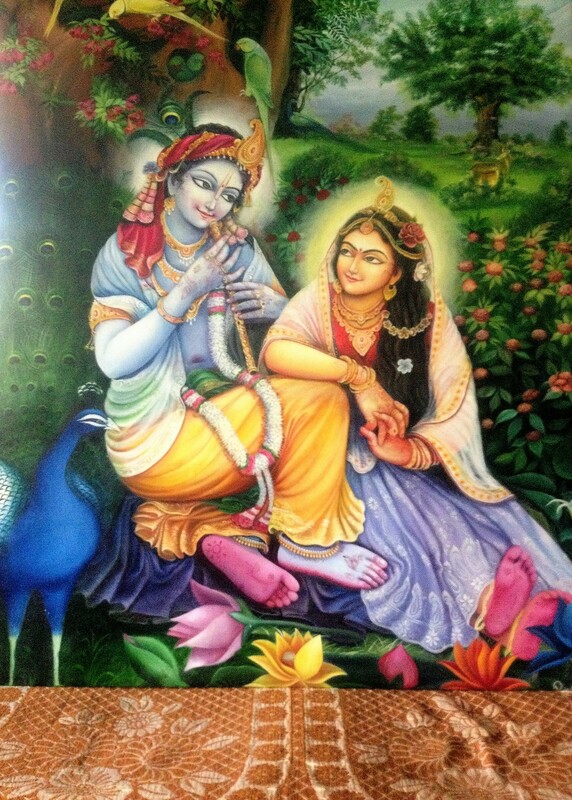 He will sees his wife also as Krsna’s devotee and love her accordingly. A Mahabhagavata sees everyone around him as a devotee (SB 11.2.45). 1. Due to space constraints, I will be brief. From its birth, the human being develops an emotional structure through its relationships with the others. All this dynamism and emotional richness are laconically labeled by Jīva Gosvāmī as māyā-sakti’s prīti. Viewed from a humanly perceptible perspective, when the person enters the devotional community, he puts into play that same emotional structure of flexible nature and gradually directs and centers it on Hari (svarūpa-śakti’s prīti). By this process of reorganization and reorientation of his emotions, the devotee goes through a progressive perceptual expansion [a]. No one enters the path of bhakti-yoga with an emotional tabula rasa [b]. In short, it is about the relationship between kāma and prema, which was the subject of the debate between you and Jagadānanda Dāsa. And I do not intend to continue here with such a discussion, of course. a. The nine stages of bhakti-yoga establish an orderly progression and not a sudden prodigious transformation. So the Cc. 3.4.192 should be understood in its context and not as an isolated text. b. Not even Śukadeva Gosvāmī was deprived of the affection from his parents during his long intrauterine existence. 2. I agree with your pleasant response. 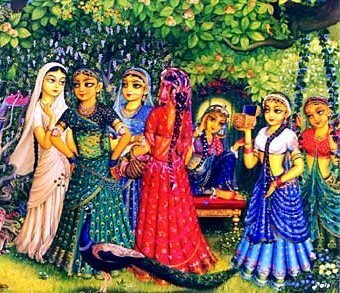 In certain circles of devotees this idea still survives today: the more a bhakta is distant and unfriendly to women, the higher he will be on a spiritual level. Regarding the mahābhāgavata, the notion of an exalted devotee in whom love for Govinda and sexual enjoyment converge is not frequent. In fact, it seems that human Vaiṣṇava sexuality is an issue completely absent in the Gosvāmī school.